We’ve talked about the bees before (save them) and the serious problems that they’re facing. This is a problem for us because they pollinate a lot of the fruits and vegetables we eat. While we’re battling the issues that are killing them. But there’s been a new idea for a stop gap solution: Robobees made from off the shelf drones. 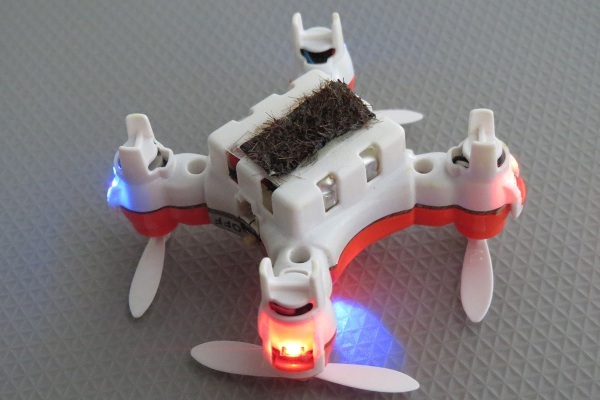 These tiny drones have hairy undersides that mimic the legs of bees. The drones themselves were purchased from store shelves. Once the hair has been applied, they are flown into flowers where they pick up and drop off pollen. This has only been tested in a lab setting, not out in the wild as of yet. Still, it has shown some promise. This is not a solution to the death of bees. We still need to curb that. Plant flowers, stop polluting! But until humanity can get that turned around, something like these fuzzy drones might come in handy. Check out the video to see them in action.